A classic Sesame Street song asks, “Who Are the People in Your Neighborhood?” The USO and Sesame Workshop have teamed up once again to bring a very important person from the Sesame Street neighborhood to military bases across the United States this year. That VIP is Katie. In truth, she’s more like a VIM: Very Important Muppet. The offspring from the longstanding partnership between the USO and Sesame Workshop, Katie was created in 2011 to serve as a voice for military children. This year, Katie and several of her Sesame Street friends are hoping to hit the road again to sing, dance and speak with young military children in the U.S. about the transition to civilian life. Nicole McClendon, the Sesame Street/USO Experience for Military Families tour manager, said smiles on the faces of military kids and their parents are the one constant she sees at every tour stop. In 2008, the partners launched The Sesame Street/USO Experience for Military Families, a free stage show that tours military bases around the world. It was well received, but it seemed to be missing something. “We heard more and more that we needed to have a life-size military child Muppet who could speak from the point of view of the children,” Betancourt said. Katie was introduced to military families by first lady Michelle Obama and Dr. Jill Biden at a Joining Forces rally in Ohio in April 2011. The character is 6 years old, wears a flower in her bright orange hair and is Elmo’s friend. She and her military family have relocated several times. Katie’s backstory reflects her audience. A study by the Department of Defense Education Activity shows military kids move upwards of six to nine times during their preschool through high school education. After Katie’s debut, the USO and Sesame Workshop knew where to take her next: on the road. They updated The Sesame Street/USO Experience for Military Families in 2011 with a new live stage show featuring Katie. The 30-minute program, “Katie is Moving to a New Base,” targets military children ages 3 to 6. It opens with a sad Katie telling several of her Sesame Street friends—Elmo, Rosita, Grover, Cookie Monster and the Purple Honker—that she must leave them behind because her father has been transferred. Her Sesame Street friends help her see that they will remain friends despite the distance. They reassure her that change is not necessarily a bad thing and that she will make new friends. “We try to evolve as times change and as the needs of military families change,” Betancourt said. “We recognized that military families are extremely tech savvy. This new website gives us the opportunity to provide this material in both English and Spanish in a much more portable and instantaneous format.” The website provides resources on not only broader topics such as resiliency and divorce but also military-specific milestones, such as deployments and homecomings. Another significant milestone, of course, is the transition from military to civilian life. The new USO/Sesame Workshop show, “Katie’s Family Transitions to Civilian Life,” draws on direct feedback from military families to address the topic in a reassuring and optimistic way. 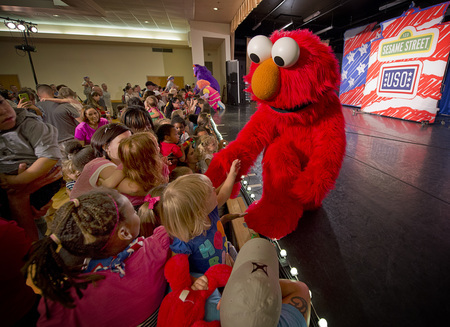 When the 2015 world tour of The Sesame Street/USO Experience for Military Families kicked off in May, it was as a double bill, featuring both the new transition-themed shows as well as the original moving-themed program. When the tour ended in October, the characters had performed more than 100 shows at 45 military bases in nine countries. —Kristin Baird Rattini is a Missouri-based freelance writer. This story appears in the Spring 2016 issue of On Patrol, the magazine of the USO.